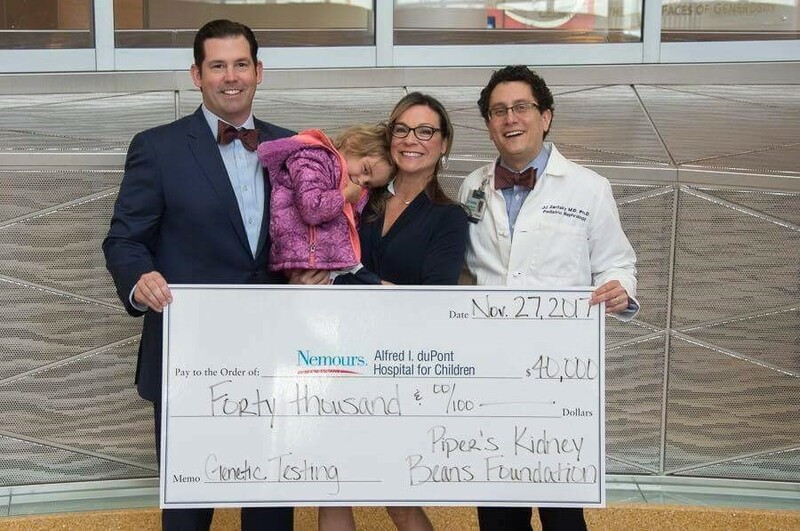 Piper’s Kidney Beans Foundation is a Delaware non-profit corporation which will raise funding and awareness for a pediatric genetic testing lab to be based at A.I. DuPont Hospital for Children. Genetic testing is the next frontier in diagnostic medicine. Each year, scientists and doctors identify previously unknown spontaneous and inherited genetic illnesses which can typically only be detected via genetic blood tests. This foundation is named after our daughter, Susan Piper Lee, who was diagnosed, via genetic testing, with Denys-Drash Syndrome. Denys-Drash is a genetic illness that causes kidney failure and the development of Wilms tumor at a median age of 18 months. Thanks to the quick thinking of Piper’s doctors at A.I. duPont Hospital for Children, Piper was diagnosed early and has since received a successful kidney donation and a significantly reduced risk of developing cancer. Although Piper was diagnosed early, it was still a challenge to get the genetic testing done quickly as the closest genetic testing lab that could offer the necessary tests is based in Bristol, England. It is our belief that all children should have access to a domestic genetic testing lab which can potentially identify genetic illnesses early and affordably. As such, our goals are to 1) raise the necessary funding for the creation and expansion of a comprehensive next generation genetic sequencing panel for steroid-resistant nephrotic (kidney) syndrome at the A.I. duPont Hospital for Children, and 2) raise funding for the purposes of subsidizing the costs of genetic testing for nephrotic disease in children whose families cannot afford it. Please join us in making these goals a reality!